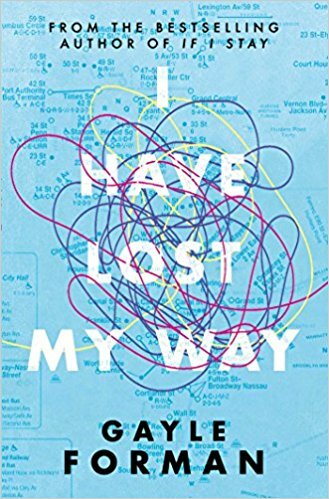 I’ve never read any Gayle Forman before so I was really interested to see what I though of “I lost my way” when I won a copy via Twitter. From the first page I was completley drawn into the story and I binge-read it in one sitting. I couldn’t help it! The book follows three people who have “lost their way”. Freya, an up-and-coming recording artist who had lost her voice; Harun, a gay muslim who is about to leave his secret boyfriend behind and enter into an arranged marriage with a woman; and Nathaniel whose home life has completely fallen apart leaving him all alone. All three stories converge at the beginning of the book, whcih follows them over the course of a single day. During this day they help each other find themselves and discover what life can be like if you’re true to yourself. I think part of the reason this book was so easy to read is Gayle Forman’s writing style. She has a really clear, simple way of putting accross a lot of complex emotion. The three main characters all jump off the page at you and their voices are all so individual. I love POV books for this reason; I enjoy hearing the inner workings of each characters minds and in this book it really helped me to see why each character so desperately needed the support of their new friends. Vitally for a POV book, each of the story arcs were captivating and well developed so there was no feeling of being desperate for a different story line to continue. They were all as strong as each other and beautifully interwoven. Each of the three protagonist’s stories were incredibly sad, however, when I finished reading the book I felt really positive and happy. The way they all came together to protect and save their new friends after only a day of knowing each other was so beautiful and I loved the dynamic between them. There is potential for a sequal to be written and I would welcome one with open arms because I am not ready to leave these characters yet. Having said that, this book did beautifully conclude this chapter of their lives so it could just as easily be left as a standalone novel.